"For vocal recordings i use the Avalon VT-737sp. It's a great-sounding compressor and a really warm pre amp." In this Vine video of Skrillex's studio, towards the end of the clip when his studio desk is shown, the Avalon VT-737sp Mic Preamp can be seen in a rack on the right side, below the Barefoot monitor and the [Antelope Audio Orion 32](http://equipboard.com/items/antelope-audio-orion-32-multi-channel-ad-da-converter). The video is a bit blurry, but the layout of the knobs and lights matches the Avalon VT-737sp exactly. Matt Bellamy's rig for the Black Holes and Revelations tour includes the Avalon VT-737sp Mic Preamp. In this inteview, Steve Aoki gives us a look to the main gear he use to produce records in both of his studios : The ''Neon Future Cave'' in Las Vegas, NV and the ''Dim Mak Studio'' in Los Angeles, CA. > As far as preamps and compressors go, I’ve got an Avalon VT-737SP in my Dim Mak studio. The Avalon gives me a warmer tone. In my home studio here [in Las Vegas] I have a different set up. I have a Universal Audio UA 6176, which is a combo of the classic 610 preamp and the 1176 compressor/limiter. Dirty South describes where the Avalon VT-737sp fits in his signal chain: "For recording vocals, I use a Neumann U87 microphone going into the Avalon 737 and then into a LA-2A compressor." In another interview he says "In the studio, recording vocals and guitars, I would run them through something like this Avalon mic pre and get a really nice, clean sound with something like a Neumann U87 or even running a guitar signal through it." "We run the vocals through an Avalon VT preamp most of the time." Below an Avalon VT-747SP, the VT-737sp Mic Preamp can be seen in Showtek's studio. Bassnectar shows off a cabinet stacked with four Avalon VT-737sp Preamps. An Avalon VT-737sp is seen in Morgan Page's LA Studio at the top of his analog outboard gear rack. A VT-737sp preamp is shown in his rack in these interviews. In an interview with XLR8R, Simon Green is asked how he records, and if he goes through a pre-amp into his computer. He responds, "I've been using an Avalon [VT-737SP] as a front end. It's a mono vacuum-tube compressor and EQ, and it's really nice... I use it for everything. Then the whole thing goes into [Apple] Logic. With the exception of a few reverbs and some other outboard stuff, I'm doing everything with Logic and [Native Instruments] Kontakt." On the right side of Matisse and Sadko's Instagram photo, the Avalon VT-737sp is giving off a green light from the center of the console. The preamp that Dntel uses for his mic is an AvalonVT-737sp. On the website article, 11th paragraph states that Em used a Avalon VT-737sp pre-amp on studio. The best pre-amp at the moment. Britney used the Avalon 737 on two tracks on Circus, according to Andy Page, the co-producer: > "I recorded/engineered/programmed/mixed 2 songs from "Circus", "Out from Under" and "My Baby", both produced by Guy Sigsworth. The vocal chain was a C800G going in to an Avalon 737, then straight into ProTools via a 192." In diesem Video sieht man den Avalon VT-737sp bei 6:03 im Hintergrund in Kollegahs Studio. In this video at the 3:22 mark you can see an Avalon preamp in the background. Her vocals on the Ellipse album were recorded through the Avalon preamp. You can see his rack mounted Avalon VT-737sp preamp's in his snapchat story. Used on vocals for Outkast's *Speakerboxx/The Love Below*. > It’s like a BCM10, but with the 33–series EQs,” he explains. “The outboard is fairly standard: Urei 1176s, an Avalon 737 pre, a Neve 1084 pre. In my travelling setup I use the Apogee Symphony and the AD16s and DA16s, which I really like. But that’s if I’m going to work at The Record Plant or somewhere. 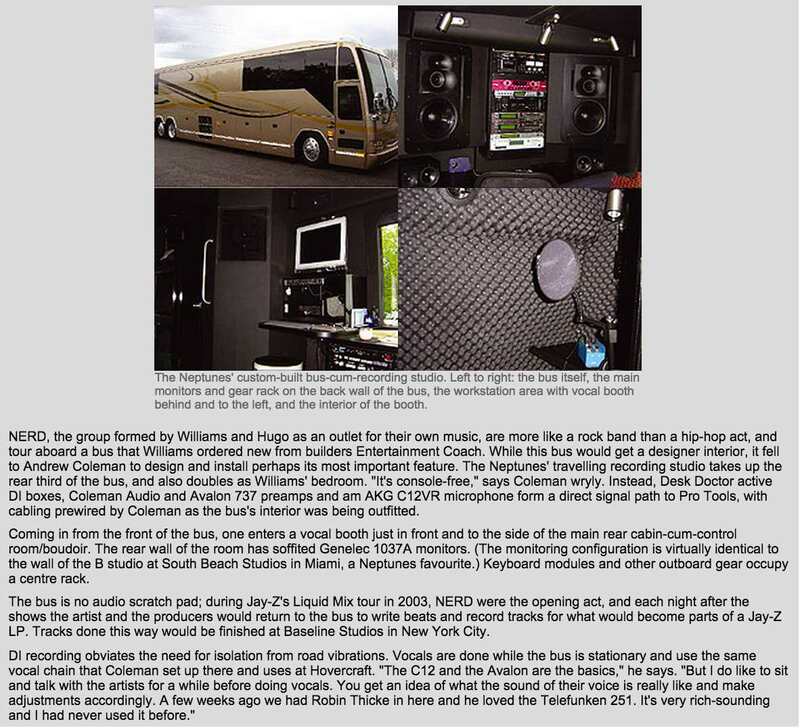 This article states that Mark Ronson uses Avalon Vt-737sp preamp. You can see the Avalon VT-737sp Channel Strip in the rack at the 2:34 minute mark on the attached video tour of his studio. "I've got an Avalon preamp, which I do the vocals through, an Avalon Vacuum Tube 737—you probably know Avalons, you must. I do all my vocals through that." "[FOH and monitor engineer Mark] Maher comments that VerTec has proved a flexible choice in all the different venues, where the system has frequently had to be ground stacked, a situation where the VerTec line array works particularly well. The Digidesign Venue is Maher's console of choice, and one of the reasons he likes it is because of its warm and natural sound. He took advantage of the console's extensive onboard processing, and ran just two additional Avalon VT737 valve compressors on the two guitars." Part of his studio setup as well. 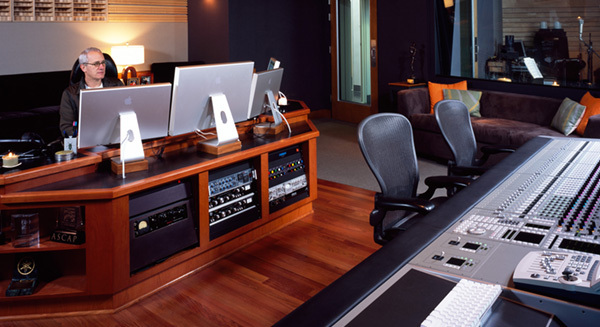 The preamps at Trevor Horn's Sarm West Coast LA studio include: "SSL AWS 924 (24 Channel) Console, Avalon 737sp, Focusrite Red (4 Channel)"
"We just matched that sound – you could not tell the difference. All I had to do was run it through an Avalon 737 mic pre, and just tweak the EQ on the front end a tiny bit. The guy who was co-producing with me couldn’t believe it. It nailed that sound." You can see the VT-737sp in Metro Boomin's studio at 2:10 in the video. A FOH stage hand sent out a couple pictures of Chris Stapleton's live rig on May 27, 2016 in Simpsonville, SC at the Charter Spectrum Amphitheatre. The stage setup clearly matches the setup seen in various videos around the web from early-2016 shows. 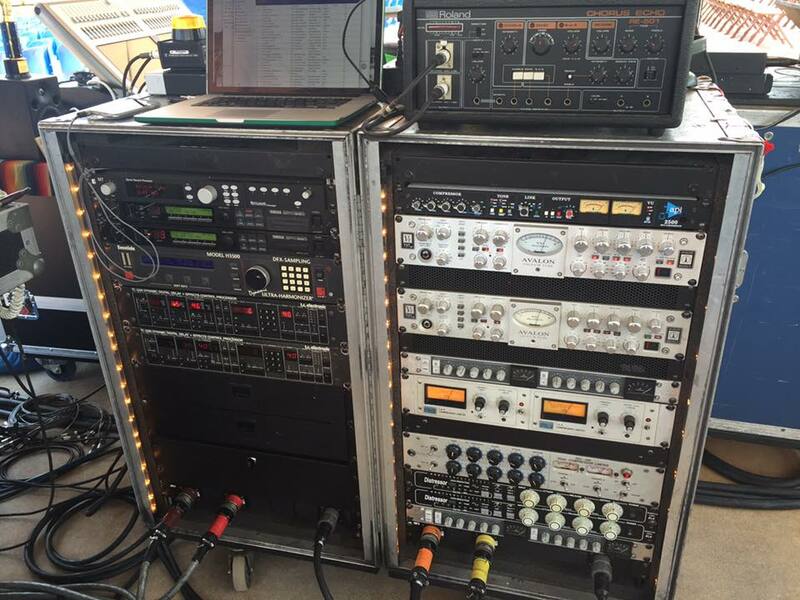 Two of the Avalon VT-737sp Mic Preamps can be seen in Chris' rack setup. An Avalon VT-737 sp can be seen at the middle/right of the photo below the monitor at Grabbitz Facebook page. Can be seen at the location specified in their studio. 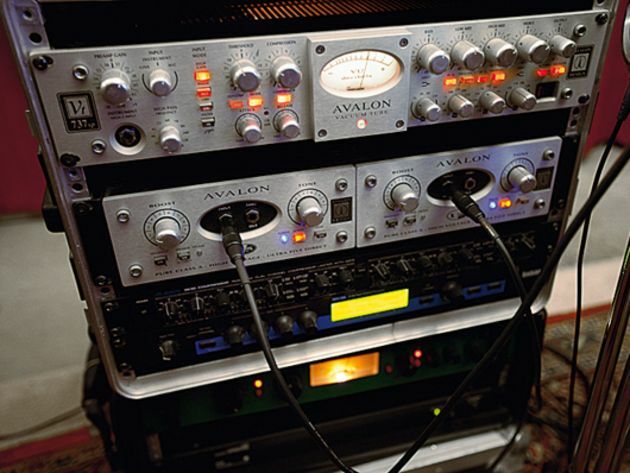 In this Sound On Sound article there is a photo of Visconti's gear, which includes an Avalon VT737SP. Can be seen at 1:33 in this video. They own 2 of them. At 4:25, Kay shows her Avalon 737sp and her Presonus BlueTube. Seen throughout the video but clearly at 11:20. He has two units, one with a silver faceplate and one with a black faceplate. In this interview, you can see the Avalon Preamp on Bushido's left. At 5:58 in the video, you can see an Avalon VT-737sp in the rackmount in the background, just behind Chris Elms. Avalon VT-737SP is included in a chart depicting Yasunori's studio (circa 2002). How do they get those clear & clean vocals? Use this with a Neumann U87 & it's magic!